Lt. Teddy Evans, Tom Crean and William Lashly, the final supporting team for the Polar party in 1912, were 238 miles from home when Evans began to suffer from scurvy. His condition deteriorated until, 100 miles out, he could no longer stand. Crean and Lashly refused to leave him and pulled him on the sledge to within 35 miles of Hut Point. While Lashly stayed behind to care for the dying Evans, Crean set out alone on an eighteen hour non-stop march to reach help at the hut. 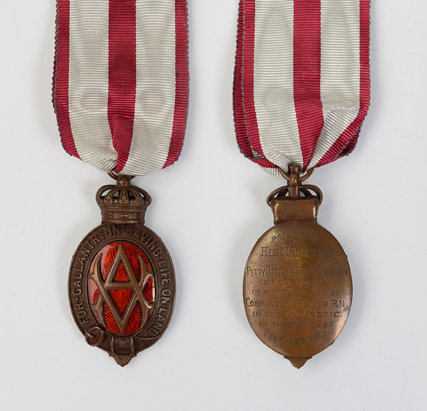 Evans was saved and subsequently Tom Crean and William Lashly were each awarded the Albert Medal. Evans never forgot the two men who had, he later wrote, ‘hearts of lions’ and he stayed in touch with them for the rest of his life.